Born in Niigata, Japan. Moved to Los Angeles, California at the age of 6. Influenced by my late mother who was a jazz singer, participated in school choir from 5th ~ 12th grade, sang back up for few bands and started to sing at my parents’ night club at the age of 17. During college, I was hired by Delta Airlines as a flight attendant, but quickly realized that my passion for music must live on and relocated to Tokyo to take a job at a music publishing company. At a karaoke party hosted by the Music Publishing Association, I was scouted to sing for a group called ‘Springs’. Taking a break from ‘Springs’ after recording 2 albums, I sang on numerous projects for Japanese record companies, TV commercials and writing songs for other artists. Currently, I am back with 'Springs' and singing for Japanese television commercials. Thank you for listening to my music! 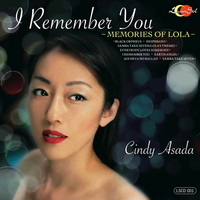 I made this album as a tribute to my late mother, Lola Asada, who passed away last year. She was a jazz singer and had a long hard fight against breast cancer. Each song on this album is filled with my memories of her. Enjoy! p.s. I am donating a portion of the proceeds from the sales of this album to the Breast Cancer Association in Japan. Please help me support them! Thank you!!! My mother used to sing this at her shows. This is the theme song from a film called 'Black Orpheus' which she has seen in her younger days. The clarinet player who performed with my mother at her shows came to the studio to play on this song for me. My mother and I used to listen to this song when I was a teenager. We would listen to the 'Eagles' record in our living room. This is the only song my mother wrote both lyrics and music to. When she was in the hospital, I promised her that I would cover this song. One of my mother's favorite songs to perform! This is standard song, covered by many artists. My mother and I used to compare Julie London, Diana Krall and Kei Kobayashi's version in the car when she was visiting me in Tokyo. Her favorite recording of mine, out of the 4 songs produced by Richard Rudolph (writer of Lovin' You) in 2006.